Israeli technology satellite. 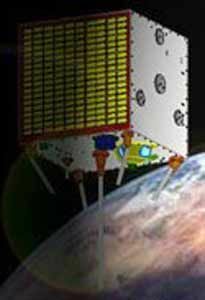 Gurwin satellites were built by the Technion Institute of Technology, Israel. Status: Operational 1995. First Launch: 1995-03-28. Last Launch: 1998-07-10. Number: 2 . Gross mass: 50 kg (110 lb). The technology test satellites included CCD cameras, a radiation detectors, ozone monitors, amateur radio transmitters, and other satellite technology payloads. Family: Sun synchronous orbit, Technology, Technology satellite. Country: Israel. Launch Vehicles: Topol', Start, Zenit-2. Launch Sites: Baikonur, Plesetsk, Baikonur LC45/1, Plesetsk LC158. Agency: Technion. Bibliography: 2, 5, 12523. 1995 March 28 - . 10:00 GMT - . Launch Site: Plesetsk. Launch Complex: Plesetsk LC158. LV Family: Topol'. Launch Vehicle: Start. FAILURE: Fell in Sea of Okhotsk.. Failed Stage: 3. Gurwin 1 - . Payload: TECHSAT-1. Mass: 50 kg (110 lb). Nation: Israel. Agency: RVSN. Class: Technology. Type: Navigation technology satellite. Spacecraft: Gurwin. Decay Date: 1995-03-28 . Gurwin Techsat 1B - . Mass: 50 kg (110 lb). Nation: Israel. Agency: RVSN. Manufacturer: Technion. Class: Technology. Type: Navigation technology satellite. Spacecraft: Gurwin. USAF Sat Cat: 25397 . COSPAR: 1998-043D. Apogee: 819 km (508 mi). Perigee: 817 km (507 mi). Inclination: 98.80 deg. Period: 101.30 min. Built by Technion-Israel Institute of Technology. Replaced earlier Russian-launched Techsat which failed to orbit in 1995..